I was pretty sure that Leverage had jumped the shark. Season three was just so-so and the first couple of episodes in the fourth season weren't much better. Against all odds however, Leverage Season Four quickly gets the show telling the type of stories that it tells best: fun, light, adventure with a lot of action and humor. Nate Ford (Timothy Hutton) was an insurance investigator who was excellent at retrieving stolen art objects for his company. That all ended when the same company wouldn't pay for his son's medical treatment and the boy died. With his son gone, his marriage dissolved and Nate started drinking heavily. He was a step away from being homeless when a job opportunity fell into his lap: he started to run cons with a group of top-rate thieves. They don't just steal from anyone though, they target the rich and powerful who have used their position to hurt innocent people and hide behind the law. A sort of modern day Robin Hood and his Merry Men. 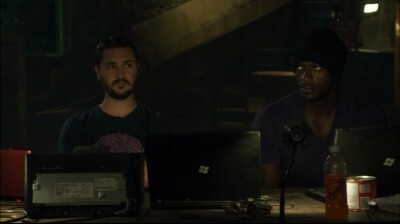 The group consists of Sophie Devereaux (Gina Bellman), a wanna-be actress who is absolutely horrible on stage, but once she's involved in a con becomes the greatest grifter in the world, Eliot Spencer (Christian Kane), the 'retrieval expert' and the group's muscle, Alec Hardison (Aldis Hodge) the expert hacker, and Parker (the incredibly intoxicating Beth Riesgraf) who is a pick-pocket, a safe cracker, and totally crazy. Together they prey on the weaknesses and vanity of the corrupt and unscrupulous to help the down trodden. As they say in the show's opening every week, they "provide a little leverage." The last couple of seasons had a larger over-arching subplot that would thread its way through the entire season only to be resolved in the finale. These bigger stories were weak and failed to capture the energy that makes the show so fun. So I was disappointed when this season starts out by setting the ground work for having another super-secret group go up against Nate's team. When they find a very sophisticated bug planted in Nate's apartment at the end of the first episode, I sighed deeply. Didn't they just do that last season? Luckily, saner minds prevailed and the 'who's spying on us' subplot is largely ignored for the whole season. It does pop up for a minute or two in a couple of episodes, but that's all. Instead the creative team concentrates on what makes the show one of the most enjoyable action shows on TV: the team and their cons. There were a lot of solid shows this season, only the first couple didn't work as well as they should have, and it's hard to pick out just one or two to highlight. The Office Job was a hilarious parody of The Office, and in Leverage's version Werner Hertzog-like director is filming the day-to-day activities of a small greeting card company. The group has to take down the clueless CEO who inherited the firm before it's sold. It's worth watching for the German director's comments on the futility of life. Long time fans will also appreciate the reappearance of some characters from earlier seasons. 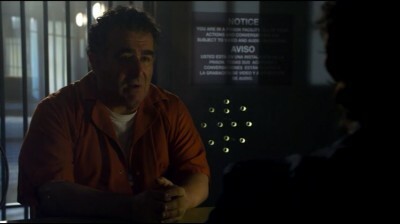 Peggy, who made friends with Parker's alias, Alice, in The Juror #6 job from season one returns (as does the running gag about Parker thinking that Alice is another person) and Jack Hurley (Drew Powell) the taco-loving financial planner from The Twelve-Step Job pops up again and tries to get Nate to stop drinking. That's not all either, as some of the group's worst enemies step on stage once again too. The show is much lighter this season, and that's a good thing. They eschewed the more serious drama and focused on keeping it fun and fast. As has been the case since the beginning, Leverage isn't a show that's connected to reality. Their cons are absurd and only go wrong when that's part of Nate's bigger plan, and sometimes even their goals are ludicrous. (In this season a grad student genetically engineers a potato that is high in vitamins and nutrients. When she refuses to sell it to a big agricultural concern, the company steals an actual potato from the woman which they put it in a foam-lined steel box and lock it away in a vault. That's ludicrous on many levels including the fact that her research would not have yielded only one potato and that she's be able to reproduce it without too much trouble.) That's what makes the show so much fun. It has a Mission: Impossible feel to it where anything can and will happen. Yes, viewers have to be willing to suspend their disbelief to a greater extent than many action shows, but that's not too hard to do when the program is so fun and energetic. This season takes some risks too, and they mostly pay off. Plot wise Nate and Sophie get romantically involved, and Parker starts to realize that she has feelings for Hardison, something that has never happened to her before. Usually when a show gets the man and woman together things get awkward (as it did in Cheers) but so far the writers have been able to keep it interesting without compromising the main thrust of the show. There were a few unique episodes too. The Van Gogh Job has the team protecting an 85 year old WWII vet from some people who think he has a missing masterpiece that he picked up when he was fighting Hitler. The twist is that the man is black, and he had to leave his small town home and join the Army because he fell in love with a white woman. He tells his story through flashbacks were the Leverage actors take on the roles of the people back in 1942. It worked very well, and was a surprisingly touching installment. They also link two episodes in an entertaining way later in the season. In The Girls' Night Out Job Parker, Sophie, and Tara stumble upon a heist that may topple a government while they're out just having fun. They've left the guys behind to play poker, but Parker calls Hardison a couple of times over the course of the show, and with each call he's in a stranger predicament. The next episode, The Boys' Night Out Job revealed what happened when Nate, Hardison, and Eliot stayed home to play cards. It was an interesting way to tell the two stories, and it was a lot of fun. The 18 episodes that make up this season come on four DVDs that are stored in a single width keepcase. The show has a DD 5.1 English soundtrack that suits the program. The infrequent explosions and gun fights make use of the whole soundstage putting the viewer right in the middle of the action. The rest of the time the track does a good job of throwing incidental sounds to various corners of the room, such as when a helicopter flies over head or when a car zooms by. It's a good solid soundtrack. The anamorphically enhanced 1.78:1 image was surprisingly mediocre. While most of the show looked fine, there were a few times when the image was marred by defects. Some scenes (mainly when the sky was a majority of the image) were grainy and looked a bit faded, and there were a couple of instances where the blacks were crushed pretty significantly. (For example, in the last episode, The Last Dam Job, look at Latimer's black jacket at 24:37.) Aliasing cropped up too, mainly in the backgrounds. I was disappointed a recent show wouldn't have a bit higher quality. On the plus side, these are minor issues. I asked my wife and kids what they thought of the picture and they didn't notice it until I pointed it out to them. The set comes with some nice bonus material. First off each episode has a commentary track by various members of the cast and crew, which are quite nice. Though I haven't listened to all of them yet, it's nice that they took the time to create a commentary for every show. The video extras are a bit light though. There's a start off with a short behind-the-scenes featurette which is pretty generic, a six-minute look at the writers in "The Writer's Room Job" that was nice and a parody of one of the episodes. There are also deleted scenes for four of the episodes, and a gag reel that has some good moments in it. 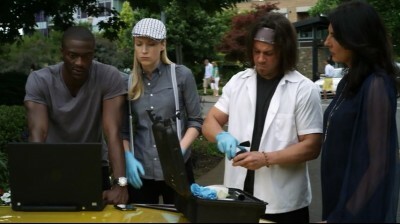 A step up in quality from season three, the fourth season of Leverage is fun, energetic, and immensely entertaining. The first couple of episodes are a bit bland, but after those the show picks up the pace and fires on all cylinders. Highly Recommended.